Aerial view Atlantic Ocean Road or the Atlantic Road (Atlanterhavsveien) been awarded the title as (Norwegian Construction of the Century). The road classified as a National Tourist Route. hd00:30Aerial view Atlantic Ocean Road or the Atlantic Road (Atlanterhavsveien) been awarded the title as (Norwegian Construction of the Century). The road classified as a National Tourist Route. 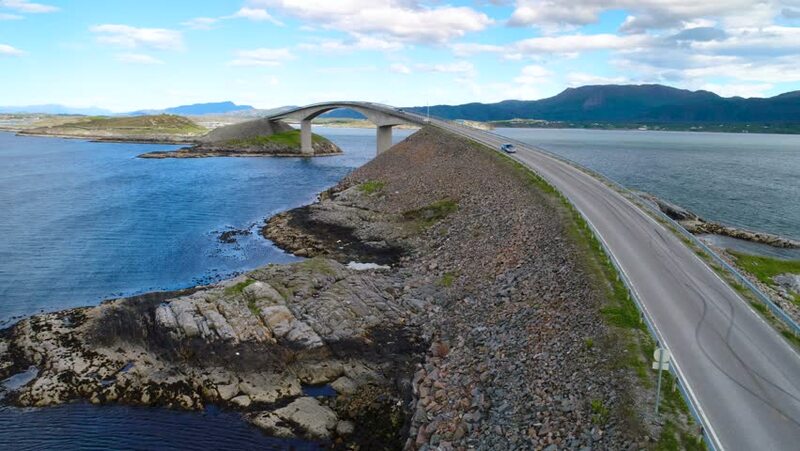 4k00:11Aerial view Atlantic Ocean Road or the Atlantic Road (Atlanterhavsveien) been awarded the title as (Norwegian Construction of the Century). The road classified as a National Tourist Route. 4k00:28Aerial view. Iztuzu or «Turtle» Beach and delta of Dalyan river . Turkey, 4K. 4k00:49Aerial 4K at Makai Research Pier and Sea Life Park Flyover from Waimanalo direction toward Makapuu. KoOlau Mountain, Blue ocean, beach, and cars. Follow vehicles on Highway. Adventure in Paradise. 4k00:20Landscape of green hills and ocean with beach. Shevelev. hd00:30Flying by scenic road and bridges on Lofoten islands in Norway, popular tourist destination on sunny summer day. 4k00:30Aerial view Atlantic Ocean Road or the Atlantic Road (Atlanterhavsveien) been awarded the title as (Norwegian Construction of the Century). The road classified as a National Tourist Route.